A polar bear shot dead after it attacked a crew member from a cruise ship on Svalbard this summer now raises question whether drones could be used to check the shores before making zodiac landings. Authorities and the cruise industry itself are skeptical. A fast growing number of expedition cruise ships are sailing the Arctic and spotting a polar bear is for many a highlight of the voyage. Although being cute, the polar bear is a predator and a human entering its territory could by the bear easily be considered a possible meal. 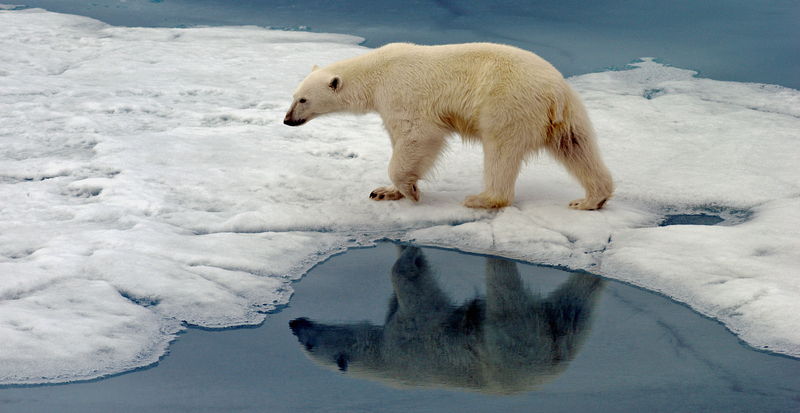 At Svalbard, Norway’s Arctic archipelago, five fatal polar bear attacks have been recorded since the 1970s. This season, a cruise ship crew member survived with injuries after being attacked shortly after going onshore to check if a beach was safe for tourists to land. Two of the other crew members shot at the bear just before the attack could have turned fatal. Before Zodiac-landings with tourists, guides and crew members have to make sure the surrounding areas of a beach is safe and without any polar bears. Guards go ashore after first sighting the beach from the ship and zodiacs. A challenge, though, is looking behind rocks or small elevations in the terrain. 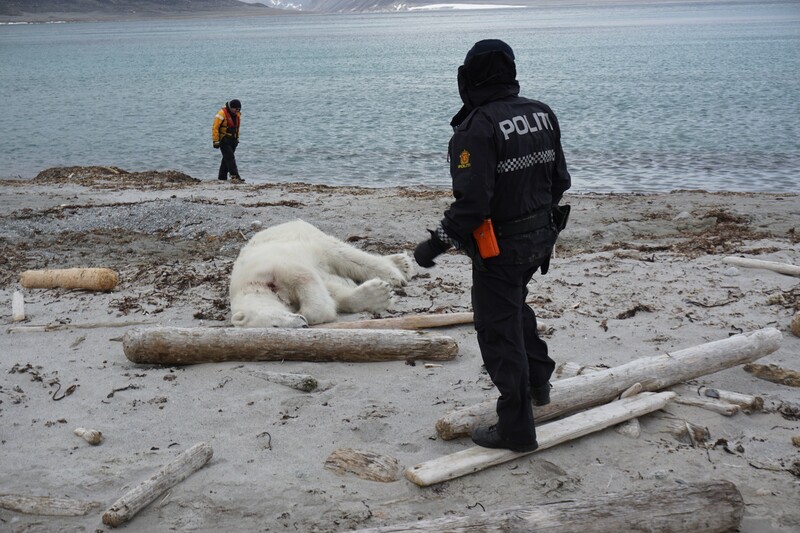 Police Chief Inspector Espen Olsen with the Governor of Svalbard will not conclude on this summer’s attack since the incident is still under investigation. Shoting dead a polar bear is a serious case. Eye witnesses at the sight, however, have explained how the bear suddenly came running from a small vale uphill from the beach and the attacked guard was unable to react himself. The German cruise company Hapag-Llyod Cruises, who operates the «MS Bremen» said the the bear was shot «in an act of self-defense» by two of the other guards that prepared for the tourists’ shore leave. Initially, the group attempted to scare away the bear by making loud noises as well as firing with a signal pistol, but without effect. With a drone, crew members preparing for shore leaves could check a larger area and also behind hills and valleys not possible to see from seaside. A hidden polar bear would be spotted from air. Today’s drones are cheap, have good live-view cameras and can fly kilometers away. «This is something that could be considered when new regulations for drones are made,» says Espen Olsen with the Governor’s office. Olsen, however, underlines many arguments against using drones and says it might very well not be a good solution. «There are coming several regulations aimed to limit the use of drones in protected areas at Svalbard and it is not certain this is a solution that will be realized,» the Police Chief Inspector says to the Barents Observer. He also points to common EU regulations on the use of drones. Disturbing wildlife is strictly prohibited on Svalbard. Frigg Jørgensen, Executive Director of the Association of Arctic Expedition Cruise Operators (AECO) agrees with the Governor’s Office that drones should be used with caution in the context of Arctic nature and wildlife. She says to the Barents Observer that drones should be subject to comprehensive regulations and strict oversight to avoid disturbance of local wildlife. «Drones is a relatively new technology that has recently become more available and accessible. There is limited knowledge of how the presence of drones may affect birds and animals in the Arctic region,» Frigg Jørgensen explains. There is limited knowledge of how the presence of drones may affect birds and animals in the Arctic region. With office in Longyearbyen, AECO aims at supporting environmental friendly and safe tourism in the Arctic. Frigg Jørgensen says her association’s members which operates expedition ships around Svalbard have banned the recreational use of drones by passengers. «There could also be a risk that drones could be used to seek out and disturb polar pears or otherwise disturb wildlife under the pretext of doing reconnaissance,» she warns. «Operators may use drones for operational purposes, e.g. reconnaissance, but must ensure that the usage does not come in conflict with other AECO guidelines, such as the strict principle of non-disturbance of wildlife,» Jørgensen tells. For AECO, caution is an important keyword for all sailings in Arctic waters. That includes reducing the risk of pollutions, like lost drones. The Executive Director also points to the risk of drones disturbing passengers’ wilderness experience.